A short par 4 where the more adventuresome can hit the ball left over the ravine, which will let you see the green. The more conventional play is to hit it to the right side of the fairway, leaving a short but blind shot to the green. Straight forward par 3 with a small elevated green. A major concern is the wind which could make as much as two clubs difference. Dog-leg par 5 to the right where the only safe way to make par is to use an iron off the tee. Big hitters can attempt to cross the water hazard with their second but the safe way is to lay up and use a short iron to the green. The most difficult par 4 on the course. Dog-leg left where a straight, over hit tee shot can go OB. The OB line runs down the entire left of the first 200 야드. The second requires a well judged slightly left shot, as there is OB on the right all the way to the green, which is protected by bunkers to both the left and right front. This a beautiful but very challenging par 3. has water on the left and trees on the right. The green which has some severe breaks has OB to left, bunkers front left and shrubbery to the rear. Short par 4 with a narrow fairway where it is important to keep the ball in play, as there is trouble left and right. The green which has bunker protection front left and right is fast back to front. A par 4 where sand abounds if the tee shot is pushed right. The green which can be approached with a short iron from the fairway has sand traps all the way on the left. With the green sloping from left to right and on three levels, putting is very difficult on this hole. Long par 4, dog-leg left where a well placed tee shot into the centre of the fairway is important to have a clear shot to the green. The ball must be carried onto the green as it will not roll onto it. 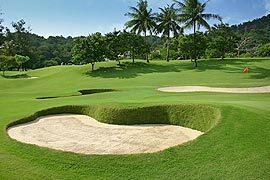 A solid par 5 which is reachable in two for the long hitter if straight, otherwise strategically placed sand on the approach will make the next difficult. The green itself is protected on the approach on the right and all down the left by sand. Tricky layered green if pin is in the centre. A challenging par 5, with water everywhere. A drive around the lake to the landing area, fairway wood to lay up short of the stream and a short iron into the large green, is the preferred way. But more balls are lost here than any other hole on the course, whether attempting the shortcut over the water or slicing a shot playing conventionally around the lake. A short dog-leg left par 4, where the best driving line is the 150 yard marker on the left edge of the fairway. The elevated relatively flat green has two traps guarding the right side approach where the ball normally plugs. Straight, but deceptive par 4. Narrow fairway landing area where a blind second shot to the elevated green is required if the tee shot is wayward, wind is normally a factor. The green is narrow and protected by bunkers on all sides and slopes from back to front. A long par 4 which is not quite as it appears from the tee. A straight shot may not land on the fairway even when the telegraph poles are avoided on the left. A lateral water hazard runs all the way down the right side of the hole. The green is large but relatively forgiving when long putts are needed. A challenging par 3 which requires a good length, accurate shot whether fading or drawing into the green. The green slopes back to front and is tricky when putting downhill. It is sometimes better to approach the pin from below the hole and putt uphill, even though it is very slow. With OB on the left and the right, this long par 4 requires that a tee shot should be hit over the fairway marker, more left than right. Long hitters should get the benefit of further roll down the fairway undulation. The large green is 50 야드 long and will test second shot distances depending on the pin placement. A short par 4 which requires a lay up about 200 야드 from the blue tees. A short iron shot is needed, keeping left into the long green which has a valley just past centre. Putting is tough and care is needed with lines. A short but difficult par 3 where more tee shots are lost in the water than on any other hole. It scenic beauty belies the fact that this 17th hole has ruined more good rounds for the average golfer than the treacherous number 10. A dog-leg right, uphill par 5 which requires a fade off the tee, followed by a wood up the fairway across the water and an iron to the green. Be careful of slicing your second your as the fairway is well protected by traps. Bunkers to the left and back of the most difficult green on the course.